New York City officials have dismissed or refunded half a million parking tickets because of an error. 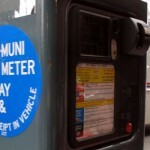 According to a spokeswoman for the New York City Department of Finance, drivers who were ticketed for failing to display their meter receipt or an expired receipt had been issued the wrong ticket. The department says error came after the violation code was changed from “4-08h10” to “4-08h1”, but forgot to note the change in the ticket. Tickets being given out to motorists weren’t updated to reflect the change — making them no good under city law. The Department of Finance gave out 400,860 refunds for tickets totaling about $18 million, and another 106,808 dismissals for tickets that had not yet been paid, totaling $8 million, a spokeswoman said. 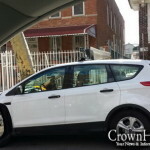 The “summons(es) issued to your vehicle(s) for either failing to display a parking meter receipt or displaying a parking meter receipt while parked in a parking meter zone contained an error and will be administratively dismissed,” the lucky drivers are told in a letter. 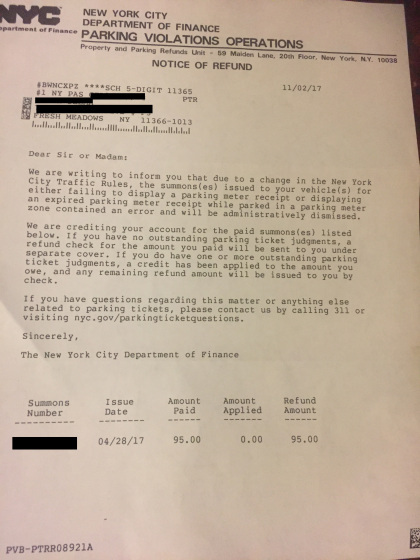 Drivers in New York City received these letters announcing a refund or dismissal of their Muni Meter parking tickets, due to an error in the code violation that was displayed. Always check a ticket for anything that could be an error (not so easy today with their being computerized).